Android phones/tablets are good devices to watch YouTube videos. However, the Wi-Fi hotspot is a must to watch YouTube videos, or you will quickly run out your cellphone traffic allowance and leads to YouTube problems while playing. Is it possible to watch YouTube offline on Android? While the YouTube offline feature fulfills this demand of some users in India, a good YouTube offline app Android is still in need for those who are out of India or tired of the buffering. Here we list a few useful YouTube offline apps for Android to stream/download YouTube offline on Android phone and tablets without WiFi. MacX YouTube Downloader - top free YouTube offline downloader app Android to download SD/HD/UHD video movie music from YouTube offline and other 300+ sites for Android Samsung, HTC One, Google Nexus, Sony etc. 98% quality with fast speed. TubeMate is the best YouTube download app that's for Android users. It allows users to quickly and easily download YouTube videos on Android phones and tablets. The app also supports HD videos download from YouTube for offline playback on Android. What's more, multiple options are packed to further customize the download. After download, you can watch YouTube on Android offline right with the YouTube offline android apk. * Download YouTube videos offline for Android at fast speed by using multiple connections . * Download YouTube videos offline in multiple format and resolutions: 3gp, MP4, MP3, FLV, 720P, 1080p. * Background downloads support to allow other activities while downloading. * Several files are allowed to be downloaded at the same time. * Supports quick Pause and Resume for a download. * Also an Internal Streaming Player. FREEdi YouTube Downloader is another good YouTube offline Android app which will provide fast downloading process. This app makes it easy to watch YouTube offline for Android users by free downloading YouTube into mp3/mp4/aac formats on Android phones/tablets directly. Multiple videos download and downloaded files playlists are supported in this YouTube offline android apk. Besides, an iOS version of this offline YouTube app android is available in Cydia. * Download and save all your favorite YouTube videos. * Download YouTube videos offline on Android into MP3/MP4/AAC in high quality. * Inbuilt streaming player to play videos. * Notification with sound for completed downloads. * Pause and Resume option downloads. 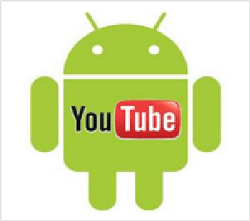 * This YouTube offline downloader Android is compatible for very lower android version as 1.5 to high end versions. TubeX is a YouTube offline app Android can rely on which allows quick and easy YouTube video download and watch offline on Android. It claims to be the fast offline downloader app with its concurrent threads, multi-connections, resume breakpoints download technology, etc. Indeed, this YouTube offline Android app can free download any videos from YouTube even the internet is slow. In fact, it works like the Android YouTube offline download app TubeMate in both speed and output formats. * YouTube offline android download in fast speed with mult-connections. * Background download multiple files at the same time. * Download YouTube offline for android in various available formats- 3gp, MP4, MP3, FLV, 720P, 1080p. * Easy Pause and Resume support. * YouTube offline android apk with self video streaming player. *option to save favorite videos to one's YouTube account. WonTube is a popular offline YouTube app Android phone and tablet users like. This YouTube downloader for Android app is available to watch and download YouTube offline on Android smartphone and tablets. It keeps a good balance between high download speed and user friendly interface. Besides, options like size, definition are also provided by this YouTube offline Android app. Just click Download and your YouTube video will start downloading for watch offline on Android. * Fast YouTube offline android download in HD quality. * Great working capability even in low-end networks as GPRS and EDGE. * Download YouTube offline with built-in notification feature. 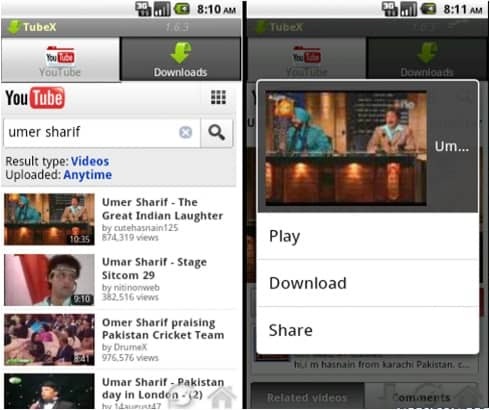 * Offline Android YouTube downloader app with player to play downloaded 3gp videos. * Fast online YouTube streaming without buffering. The YouTube Downloader is another welcomed YouTube offline app for Android. As its name suggests, this YouTube offline android apk provides simple solution to watch and download YouTube videos offline on Android. In whatever format, quality and resolution, the YouTube offline downloader android app will download it quickly. It also supports multiple video download at one time. * Download YouTube offline on android phones and tablets fast. * Convert the downloaded videos to various video formats. 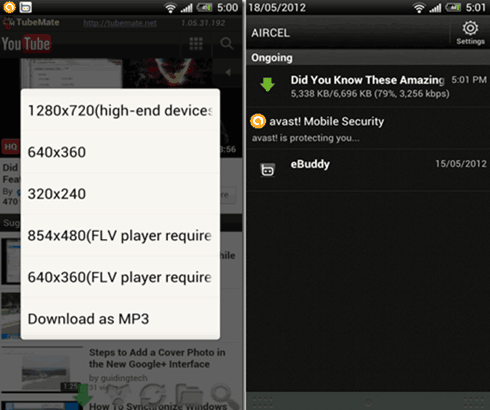 * Built-in video player allow users to watch YouTube offline on android. Verdict: the five Android YouTube video download apps are among the best downloaders in delivering the most efficient and pleasant YouTube downloading process. Of course that each will excel others in certain aspect. However, if those offline YouTube Android apps can't satisfy your needs, for example, they don't support enough other online sites, or they are available on Android 6.0 Marshmallow, the YouTube offline downloader Android 6.0 M may help. 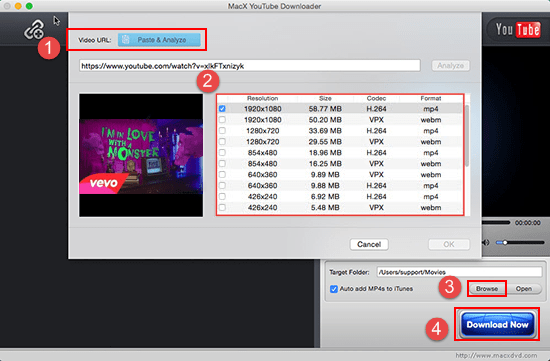 MacX YouTube Downloader- a 100% clean and free YouTube offline download app to free download videos, movies, MP3 music, full playlist/channel from YouTube in MP4, WebM, FLV SD FLV SD 720P/1080P, 4K 4096p/8K, 3D Bluray in fast speed and high quality for playback on Android 6.0M or earlier phone/tablets like Samsun, HTC, Sony etc. It also supports free download from other 300+ online sites like Dailymotion, Vemio, Vevo, Metacafe etc in batches. A built-in player also allows users to watch YouTube while downlaoding. No virus, malware or plugins. To use this YouTube offline downloader for android to download YouTube video music, the process is pretty simple. Just follow the guide below and enjoy. 1. Free download the free YouTube downloader app. Copy and paste the URL of the video or movie you want to download from YouTube to the address bar and click "analyze" to load the video details. Alternatively, click "paste & analyze" button to automatically detect the video opened in browse. 2. Choose format, resolution, and file size for the video to be downloaded. 3. Click "Browse" button to specify an output folder on your computer to save the output files. 4. Hit "Download Now" to start the 4K 1080P/720P YouTube videos offline download for Android.